You are here: Home / Pro Players / Bryan Bros. Foundation Raises More Than $100,000! 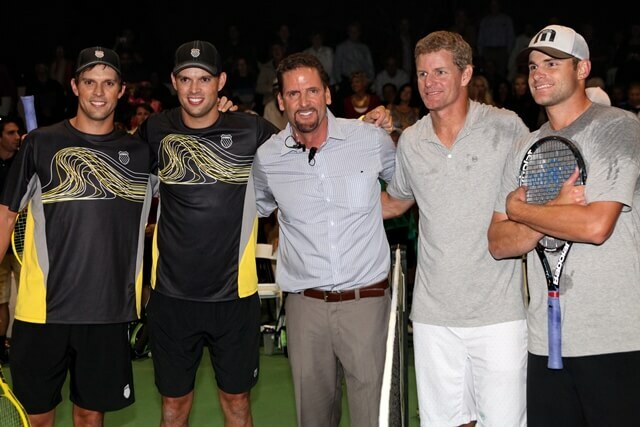 Bryan Bros. Foundation Raises More Than $100,000! Camarillo, Calif., (Oct. 12, 2013) – The V-Grid Tennis Fest Featuring the Bryan Bros. just keeps getting bigger and bigger each year as the popular Ventura County fundraiser presented by Alexander Cadillac once again raised more than $100,000 for both the Ventura County Junior Tennis Association and the Santa Barbara Tennis Patrons, as well as other local causes and regional charities supported by the Bryan Bros. Foundation. More than 40 local wineries and restaurants participated and the Bryan Bros. performed for the crowd. For more information on the Bryan Bros. Foundation see the website at: http://www.bryanbros.com/about-the-foundation.html. The tournament website is: www.bbtennisfest.com.